Summer is here (almost). Bring on the sunshine and lots of it! Here’s how I made the card for the Simon Says Stamp flickr challenge. Hero Art mid-tone shadow ink was used to stamp the sun from a SSS stamp set and then the sun was die-cut using the coordinating die. I die cut a white panel from 80# cardstock and I also used the same die to cut on a frame from blue cardstock. The die I used cuts stitches inside the die-cut piece as well as outside it. I really like the double-stitching effect. The white panel was ink-blended using a cloud template. I moved the template around to create staggered clouds using Distress inks. I love how it turned out. The sentiment was stamped in black ink. I then glued the blue frame onto an A2 card base and glued the white panel inside the frame. I die-cut a piece of white fun foam using the same die I used to cut out the stamped sun and mounted the fun foam onto the back of the stamped sun and adhered it to the card front as you see here. Blue sequins in various shades and sizes were added as embellishments to finish the card. 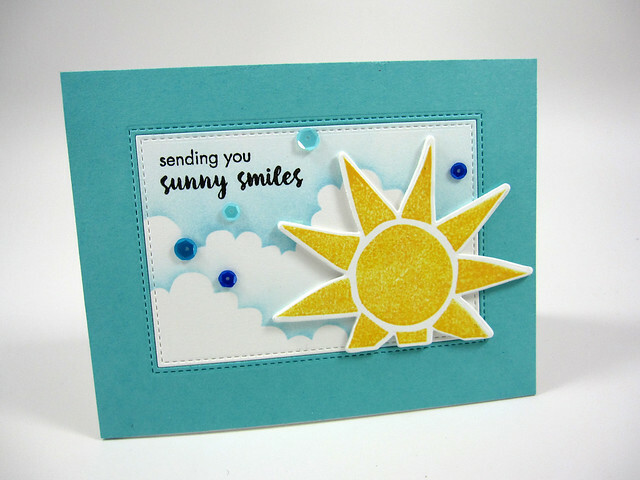 Dies: SSS: Sunshine die (coordinates with the SSS My Sunshine stamp set); My Favorite Things: Die-namics: Inside & Out Rectangle STAX. Cardstock: Neenah Solar White 80# for front card panel; Papertrey Ink: Hawaiian Shores (Frame); Neenah Solar White 110# for card base. Stencil: Cloud Template (stencil) from Impress Cards and Crafts. Inks: Hero Arts: mid-tone Shadow Ink in Butter Bar (sun); Distress Inks: Tumbled Glass for blended sky/clouds; Versafine Ink in Onyx Black (sentiment). Other: Avery Elle sequins in Caribbean Blue.